Just A Second! 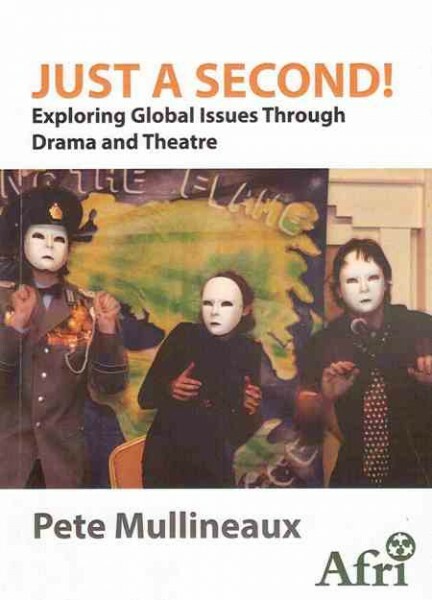 Exploring Global Issues Through Drama and Theatre is a development education resources offering school groups an accessible guide to exploring global issues through drama and theatre. The book opens with coverage of Afri’s 2013-2014 ‘Just A Second!’ project which focused on the theme of militarisation. This is followed by the full texts of five mini-plays that were devised with young people taking part in Afri initiated development education projects in primary and secondary schools during the years 2005-2011. These plays can be read or acted out, but more importantly are designed to act as a stimulus for further drama exploration, discussion and debate. With this in mind they are accompanied by multiple suggestions for follow-up activities, linking across the curriculum so that schools groups, youth theatres, college students and others can explore the themes and issues raised for themselves. Pete Mullineaux is an Arts facilitator currently working on Afri’s ‘Just A Second!’ schools programme in secondary schools in Galway. This publication received funding from Irish Aid’s WorldWise Global Schools and Concern WorldWide.